I was going to write about ocean beaches and tides. I was going to write about taking my daughter bra shopping. Instead, I'm perplexed by something. Maybe I shouldn't be. Even though some people might think I do, since I watch hardly any television and prefer the print edition of the New York Times, I don't actually live under a rock, and so recently I did see that the Pioneer Woman now has a line of housewares at Walmart. A picture flitted across my screen the other day and I was all like "what?". 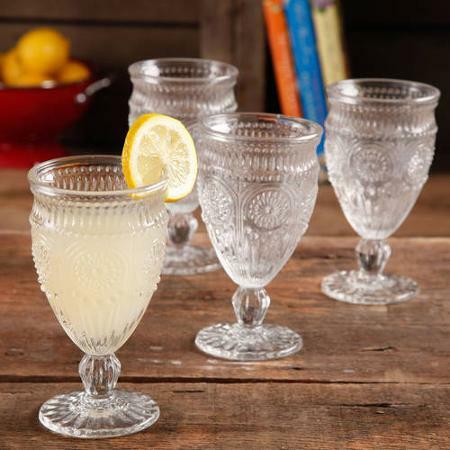 Because included in her pots and cups and lemonade dispensers and gaudy flowered plates were some glasses. Pretty embossed glass footed water goblets. Pioneer Woman's glasses, at Walmart. Friday afternoon Nassau County Snacks. Is this what happens? Joe Schmo says "I want a line of housewares" for Walmart and they just go out and pick and choose already existing shite? Damn. I tell you, I have nothing against Ree and Walmart making a buck, but man, I'm never looking at those glasses of mine the same way again.